Even if you are enthusiastic about the history and keen to share your knowledge, the girls can find 'Guiding History' to be a bit of a dry subject and rather school-like, unless you can find a way of making it interesting. So - what's important is finding a way to generate that spark of interest which helps the girls to relate to some aspect of the history, give the girls a reason to be interested and enthusiastic, making the history relevant and interesting to them. After all, to them, 1919 and 1999 are both equally ancient history, even if they don't seem so to you! The obvious starting point would seem to be the Brownie and Guide 'Traditions' badges, but there are other options too . . .
A posh phrase, but basically it means doing things the way they would have been done at a specific time in the past. So some Counties have held special camps where the girls get to dress up in period uniforms or replicas, use genuine or equivalent equipment, and try to camp in the way they would have done in 1910, or 1940, or whatever other era is chosen. Even a camp from more recent decades will feature aspects which some of the girls will find quaint - back in the 1980s, toilet blocks on campsites were very rare and Elsan toilets were the norm at most camps, an experience which few who had to use them would forget! We had pots of tea at every meal, diluting juice occasionally, and never had fizzy juice other than at parties! 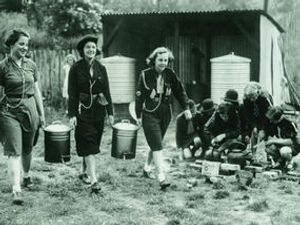 Although re-enactments take a lot of work in terms of acquiring and organising equipment (and researching in order to keep things 'period'), the girls really enjoy going 'back to basics' and learn a great deal from it (of general social history as well as of Guiding history), and period books, old logbooks, textbooks and camping catalogues/adverts can be obtained to help work out what equipment was available in a given era, and what would have been in common usage - and it's worth asking around for memories, often there will be someone who camped around that era and can give you an idea of how things were managed, what sort of food they had, and what sort of activities they did. How did they cope with camping during blackout days, when all the fires had to be out by twilight and only shaded torches used? What sort of beds did they have before sleeping bags and foam mats were commonplace? What sort of menus did they have? What activities did they do? In September 2009 I held a '1939' Guide meeting, utilising all the media coverage of the anniversary - the week before, the Patrol Leaders were warned that there was a growing risk of WWII breaking out, and that if it did, then both of the Guiders were liable to be called up for war service at short notice due to being in the relevant age group (which we actually were), so the Patrol Leaders should plan and be ready to run the Guide Meeting the following week. For the sake of the insurance the Guiders were (of course) both physically there, but we literally sat in the corner, declined to answer questions, and would only have intervened if it was a question of safety. I left the roll books, the readings book and other necessaries and resources on a table - the sort of things I might have dropped off to one of the Patrol Leaders just before I set off for my 'destination unknown' - it was up to them to run the whole programme from start to finish, opening, closing and all - a challenge, but they enjoyed it, and it gave them just a taste of what they could have had to do week after week, as Patrol Leaders in wartime, in order to keep their unit going in the absence of adult leaders . . .
For younger age groups especially (although it can be fun for some Guides too) actually trying on old Brownie or Guide uniforms, seeing the equivalent old books they had, and finding out about what they had to carry in their pockets and why can be really good fun. What equivalent things might the modern Brownie be carrying in her pockets? Were they better placed to 'Lend a Hand' or 'Be Prepared' with the equipment they carried and the skills they had to learn, than we are now? Often, there is shock that in the past Brownies wore thin cotton frocks 12 months of the year - but then, children in that era weren't used to double glazing and central-heating in their houses either - when considering history, applying the context is always vital! Acting out 'scenes' can also work well with younger age groups - if they get to act the part of the young girls who were enviously watching their older sisters heading off on the Guide Hike while they're stuck playing in the garden at home, they feel a similar burning urge to campaign for a 'Junior Guides' group - that the 8-10 year olds back in 1910 - 1914 allegedly did! It can be fascinating to challenge Brownies or Guides to have a shot at some of the challenges girls of their age group would have been tackling in decades past - can the Brownies pass the 'ball-throwing test' or the knitting, would the older Guides love the chance to plan and carry out a 'First-Class Hike'? Would the Rangers relish doing some of the 'Home Emergency Service' challenges - or are they surprised at the sort of things that Rangers were expected to take on and the sort of responsibilities they shouldered, especially during wartime with it's dangers - operating a stirrup pump as the incendiary bombs fell all around? Making up and dispensing medicines to patients in hospital? Going into bombed buildings in order to help people recover their posessions? Working on mobile canteens travelling into newly-bombed areas in order to supply food to people made homeless whilst the rescue work is carrying on all around? Board games can often be adapted into fun teaching tools for our purposes - could you create a 'scenarios' game of snakes and ladders where a problem arises but the Brownie who has remembered to bring her pocket kit has the means to solve it and so goes up the ladder? Could you use pictures of old and current badges to make a pelmanism game? Create a form of Trivial Pursuit or Taboo quiz for Guiders or Trefoil Guilds, or have a World Badge Beetle night? One common option for units who are celebrating unit anniversaries is to hold a meeting in the way it might have been done back when the unit started - even if the unit has only been going for 10 or 20 years there should be some differences compared to how you do things now, and if it has been going longer there could be many more . . . ! Pictures of old uniforms can be had, and with your County Archivist's help (particularly if you give them plenty of notice) it may be possible to borrow actual uniforms, and access books of games and songs from the right era so you can try some of them out with your unit - they might catch on and be added to your current repertoire! So - what did Rainbows do before Roundabouts came in? I'm currently developing some pages on the website which will give an idea of what each section was up to in a given decade - the testwork, typical games, songs and activities from books published in the relevant era - to help with this. A time capsule is a container in which you store items and artefacts from 'now' to share with unit members of the future - by which time they'll be historical. If you have plans to actually bury it in the ground, then you would have to buy one of the special canisters which are purpose-made for burying, as otherwise the contents would be damaged by condensation - but you could opt to prepare and seal up a plastic or tin box, and store it, marked with the date when it is to be opened, in a cupboard within your hall, which would be easier and more economical, albeit less thrilling than actually digging for 'buried treasure'! The best things to include are the things which are seemingly ordinary and everyday now - the prices of things like a pint of milk or loaf of bread, a current newspaper or magazine, catalogues of the current 'latest technology', clothes catalogues detailing current fashions, details of what the girls' ordinary life is like and notes of their hopes or ambitions - as these are the things which are most likely to change over the course of 10, 20 or 30 years, and become quaint, and fascinating. And whether you actually bury it in the ground or not - make sure you keep a safe note of where it is located, and arrange a reminder of when it is due to be opened to be passed on to future generations of the unit, so you don't forget it or lose it! Often, a tray of seemingly random objects, or some items laid out on a table, or some old clothes on coathangers - is comparatively dull, whereas having things explained, (or to use the jargon, 'interpreted'), can make all the difference to the level of interest generated - a camp blanket or a photo album can come alive if someone can point out that "that one is a hostess badge, just like the one you've got" or "we had no choice but to use those lat toilets in that photo at my first camp - I dreaded it, but we were there for a week so sooner or later you just had to cope with the chemical smell - and the noise of opening that long zip on the tent meant everyone knew what you were there for, it didn't matter how casually and discretely you had happened to stroll in the general direction!" Another great option is for the girls to meet 'old Brownies or Guides' - could your unit visit an older Trefoil Guild group, or visit some of the residents in a residential home for older people, to chat to them and find out what sort of activities they did when they were young and find out how they compare? They may have memories of Guide meetings, camps and rallies they'd love to share, remember their favourite games or songs - and they'd be keen to hear what the units do nowadays too, maybe some things haven't changed very much after all - it could become a really interesting exchange for both groups . . . It can be fun to get hold of old books or magazine articles, and have a go at the activities - are the games quaint, or actually still really good fun? Could you try out those backwoods cooking recipes or try that hike idea or nature game? Sometimes there's no telling what will catch on - at a recent Guide event girls from my unit have been fascinated by making tapestry coasters on plastic canvas - such that the leaders had to absolutely insist they were put away while the dinner plates were on the table, at another a group came across a Guider doing crochet during the rest hour - and badgered her until she got out some spare hooks and oddments, and taught them how to make 'chains' . . . and some things are always fun, especially if they involve food! Particularly where you have regular access to space such as a notice board, then displays can be useful - but although it may be tempting to do it all yourself, the best ones are often the ones where the girls themselves are involved in creating them and choosing what sort of things to put on show. What topic to they think it should cover, what items do they think should be displayed, what colour schemes do they reckon work best? Sometimes it's fascinating to see which things they would choose to pick out for display, which things they find interesting, and think other people would too . . .
Give each group, pair or individual a name: Robert Baden-Powell, Agnes Baden-Powell, Olave Baden-Powell, Boy Scouts, Girl Scouts, Girl Guides. As each name is mentioned, the relevant players runs down the room, round a chair and back to their places – first back scores a point for their Patrol/team. If you wish, and your hall is roomy enough to allow it, when Thinking Day is mentioned every team can run! In 1907, the famous army officer Robert Baden-Powell ran an experimental camp on Brownsea Island, in England. He had been working for many years to adapt one of his army manuals for use by boys’ clubs, and wanted to test and see if it would work. The following year, he published the book ‘Scouting for Boys’, and soon, all over the country, gangs of boys were meeting, and calling themselves ‘Boy Scouts’. But it wasn’t just boys – girls saw what their brothers were doing, sneaked looks at this exciting new book, and formed Patrols of ‘Girl Scouts’ too - and soon it was spreading quickly! At first, Robert Baden-Powell was keen to see the development of both Boy Scouts and Girl Scouts – but he gradually faced complaints from some members of the public who were not happy about girls hiking about the countryside by themselves, or camping out, or about rumours of mixed activities. Robert Baden-Powell feared that the negative publicity of this type might harm the growing good image of Boy Scouts. Finally, at the great Boy Scouts’ rally at Crystal Palace in London, the newspaper reports focussing on the group of several hundred Girl Scouts present, including a small group of girls who had gate-crashed the event because they hadn’t applied for tickets, forced him to act. He asked his sister Agnes Baden-Powell to adapt Scouting to make it acceptable to girls’ parents – without putting off the existing Girl Scouts! Agnes Baden-Powell quickly started work on the tricky task, and in 1910, the new group for girls was founded – with a name change, for they were not to be Girl Scouts, but Girl Guides. In 1912, Agnes Baden-Powell wrote ‘How Girls Can Help to Build Up the Empire – a handbook for Girl Guides, adapted from her brother’s book, ‘Scouting for Boys’. That year, Robert Baden-Powell began an 8-month long international tour by ship, to visit Boy Scouts and Girl Guides abroad. On the ship he met young Olave St Clair Soames – not long after returning from the tour they were married, and she became Olave Baden-Powell. Olave Baden-Powell quickly became involved with Scouting, but it wasn’t until 1916 that Olave Baden-Powell first became involved in Guiding, as County Commissioner for Girl Guides in Sussex. Within a few years, Olave Baden-Powell had taken over the running of Guiding from Agnes Baden-Powell, and in 1930 Olave became World Chief Guide. The curious thing is that although they were not the same age, Robert Baden-Powell and Olave Baden-Powell did have the same birthday – 22nd February. Because the World Chief Scout and World Chief Guide shared the same birthday, that day was chosen to be the international Thinking Day. So now you know that Boy Scouts were founded in 1907, why the Girl Scouts became Girl Guides in 1910, that they were based on the idea of Robert Baden-Powell, which was adapted by Agnes Baden-Powell, that Olave Baden-Powell was World Chief Guide for many years, and finally, why Thinking Day is celebrated on 22nd February every year!